UIIC AO Recruitment 2016: United India Insurance Company Limited (UIICL) had released the notification for Administrative Officer (AO) Scale 1 posts. There are a total of 300 posts that will be filled through a written examination and interview. The vacancies are in Generalist and Specialist cadre. Here you can check UIIC AO Recruitment 2016 with all the details and apply online. United India Insurance Company Limited had advertised for filling 300 posts of Administrative Officer in Generalist and Specialist cadre. The vacancies will be filled through an all India competitive examination. The detailed notification of UIIC AO will be available on the official website www.uiic.co.in a few days prior to the starting date of applications. The applicants age should be between 21 to 30 years for unreserved category. For relaxations of reserved category, UIIC AO Notification should be checked. 2. Specialist: Graduation in related field or equivalent. The applications will only be accepted via online mode at www.uiic.co.in. No other mode of applications will be preferred. Eligible candidates can submit online applications from 06.05.2016 to 17.05.2016. The written examination is likely to be conducted online. However it will only be confirmed after the release of notification. 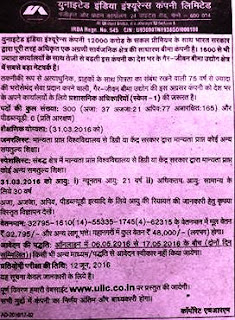 The written test is scheduled to be held on 12 June 2016. The last date to apply is 17 May 2016. The notification pdf is avaiable at official website www.uiic.co.in.